Thinking of volunteering with Manisha UK? Below are the considered views of two of our latest volunteers, Elaine and Alan Hewitt, answering what they consider the most likely FAQs that might spring to mind. We'll look to build these, and all feedback we receive, into our main FAQ pages to give volunteers the best possible view of the commitment they are about to make. By: Elaine Hewitt, primary school teacher. Alan Hewitt, secondary school deputy head, science and maths teacher. In June, we reported the severe damage caused to the roof of the school building that Manisha UK had funded improvements to over the last 2 years. 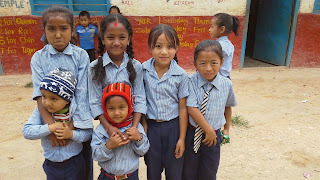 The school, that we know as Batase, the full name is Shree Bhagawati Himalaya Higher Secondary School in Batase community, asked for help from friends and supporters. Guston Primary School and several individual donors sprang into action to raise funds that we sent to help towards the total cost of repair of the roof. 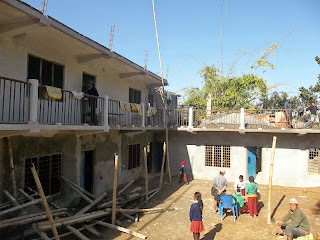 In the last two weeks, the roof has been completely replaced and the school building is now back in use. Many thanks to the children, teachers and parents of Guston Primary School and the other donors who helped Batase School complete this project; working against the poor weather conditions to achieve a very impressive new roof! Andy Bridges and Rob Davidson completed their placements at the end of March 2014. Below are the final reports on status of each of supported schools through the eyes of Andy and Rob. These reports serve not only as testament to the excellent progress made to date at our supported schools but also of the success of the NQT Placement Programme and the Teacher Training Programme driven through it. A huge thanks to Andy and Rob for their time and efforts during their placements and for their invaluable feedback and input to the programme for the 2014/15 NQT Placement Programme. Our smallest school but one that has made great strides forward under the guidance of Ram Lal who has been excellent for the school. 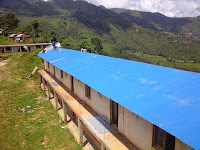 The school now has three new classrooms which were completed during my stay. Their focus now is on providing furniture for these classrooms. This would make an excellent twinning project. If it is possible to fund school furniture I would suggest a move away from the traditional benches which are both uncomfortable and difficult to work from for the children. The teachers at Bagnas were receptive to new ideas and there is certainly some creativity in their lessons. I saw on an unplanned visit to the school the children had made models of animals out of mud / clay. When I brought coloured paper to the school some of the teachers made their own displays. I would have liked to have seen the resources we brought along out more. They did say they would get round to displaying them properly but this had still not happened by the time they left. With their new buildings this school will be in a much better position – the old classrooms were in poor condition. Not yet officially a twinned school, though we hope this will be confirmed soon, I see a lot of potential in this school and they have some excellent teaching staff. They have a room to read library which they must try and use as much as possible. They are doing some good things though for example they have a reading scheme set up whereby books are levelled by difficulty and the children’s progress is recorded. This was excellent to see and something we need to encourage in our other schools. Some of the classrooms are in a fairly poor state with cracks in the structural walls. The school cited security of the classrooms as a reason that they do not put up display work. The classrooms where there is a secure door do have more display work though they are also the younger children’s classrooms so that may also be a factor. The teachers seemed to be interested and enthusiastic in what we were doing and the English teacher, a young man who belongs to the Dalit caste (lowest caste) is particularly strong and enthusiastic. His English was amongst the best we saw. The teachers who attended the training were always willing to take an active part. Whilst there I saw the Year 8’s doing extra studying in the evenings and early morning which shows that the teachers are committed to getting the best from the students. Possibly one of the poorest (financially) schools we work in, in a beautiful but remote setting. Some of the primary classrooms located at the top of the hill were certainly amongst the worst I saw. A couple of them were little better than cow sheds. The lower part of the school actually has much better classrooms, including a new block containing 2 new classrooms, including the nursery. Whilst it is great to see the nursery being put in the best of the classrooms it is also important that they maximise the use of these buildings which at present is not being done. I did advise them that they should get the year 1’s or year 2’s in these classrooms in the afternoon if the room is vacant. Since there is no actual equipment in the classrooms this should not be a problem and would provide them with a much better learning environment. The English teacher, Manu, spoke a reasonable level of English and it was mostly him who came to see our lessons. We did see some teaching outside which was good to see. A few of the teachers were looking to build a portfolio of pictures and written testaments from visitors in order to potentially attract tourists to come and stay in the village. The money from this would be used to provide funds for the school. It is good to see that they are looking into ways to help make themselves self-sufficient. The village is certainly in a beautiful setting and would appeal to tourists but it may be too far off the beaten track to attract many tourists. I was only able to visit this school on 2 occasions (with one visit being only for a meeting). The school’s relationship with Manisha UK has suffered on the back of various promises made by Mahendra which were not followed through. 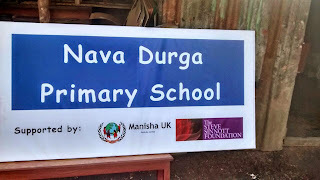 Unfortunately due to his promises the school purchased an area of land behind the school on the understanding that Manisha UK would fund a project to build them new classrooms. Unfortunately this was never cleared with the UK and the land remains completely unused. It is a raised area of land and I did make brief enquiries into how much it would cost to level out the land to at least give them more (much needed) space. I was told the cost for this would be around £200. It took a long and difficult meeting with the people here to regain some trust and they allowed me to come and teach there for 2 days but they later cancelled another trip there I had planned. This school needs to be visited as soon as possible to re-enforce the message that we do want to help. The classrooms in this school are small and very cramped and the building is fairly old and not in the best state of repair. There is no library at this school and resources were fairly minimal. A bookshelf was given to this school at the end of my trip and was deliberately an open bookshelf so that the children can see and use the resources. It will be important to check that the resources are out and available for the children to use and enjoy. Pipal Danda was the school I visited most during my trip though with only one day of teaching. Work on the new school building is now underway again and the old building has been completely cleared. At my last visit they were working on a new toilet block and this had been prompted by inspectors coming around. The building work on the main building has also resumed though it has been made clear to them that no extra classrooms should be built. My relationship with Tulsi, the headmistress is good and she has even sent me an occasional text since I returned to update me on progress. She is very much behind us and has really taken on board the advice given. The school was one of the best I visited in terms of displaying children’s work though there is still much to be done. On my final visit, one of the units underneath the school was being used for training of some sort and so hopefully the school can make some money from letting out the units. This is another school that needs to be visited as soon as possible to help reinforce our relationship and check on the progress of the building work. I was far more impressed on my second visit to this school than on my first visit. They seemed to have really taken on board some of the things we said and they had made some effort with display work. The teachers were responsive to the idea of re-arranging the desks away from the traditional rows but I would be interested to know if this is still being used. On my visit here the school were using Manisha UK funds to extend the playground area, though the idea of a safety railing at the back of the school seems to have been abandoned. There is no library in the school but when we visited we did see children coming up and choosing some of the new resources to take a look at them and the staff arranged them promptly so that the children could see them. They are, however in the staffroom and so my feeling is that the children may not feel completely comfortable to come in. They have been given a new bookshelf by Manisha UK and so it would be nice to see that this has been set up in one of the ground level classrooms so that all children can access the materials. Overall I was really impressed with the attitudes of the teachers here and their apparent willingness to try out new ideas. One of our bigger schools with classes right up to 10+2. The school has a library and they have done a really good job on display work in the nursery and some of the lower classes. Some of the classes in the main building are quite small but perhaps the worst building is the one opposite the main building which has four classrooms. The walls do not come up to the ceiling and so the noise carries around all four classrooms. Some of these classrooms are also very dark. The school has spent significant money on levelling out areas to ensure they can have playing areas and have got a volleyball court set up which is good to see. I did not see the tolilets in this school but was told they had separate facilities for children and staff. The school seemed very willing to take on suggestions with Manisha UK and the relationship with them is very good. This is one of our largest schools and one that is doing quite well. The teachers are fully on board with what we are doing and always take an active part in our teacher training sessions. Mr Singh, the head teacher, took a lead role in part of the science teacher training and is certainly someone we will look to in the future in our aim of getting Nepali teachers training teachers. The school has a good sized playing area, though one side has a steep drop of a few metres, which I consider to be quite dangerous, particularly when children are running around in that area. The school has an excellent library, courtesy of the ‘Room to Read’ foundation. What does slightly concern me is how much books and resources are bought out for children to use – they understandably want to keep them safe but we need to ensure they are being used as widely as possible. The school has shown some good innovation in their classrooms and there is some good display work up, though more would be better! I was also happy to see that they had moved away from the traditional rows of seating into a way that is more conducive to collaborative working. This is one of the schools in which we hope to trial laptop computers and I feel this is one of the schools which is most likely, at present, to gain maximum benefit from this. This is our biggest and furthest school from our base in Tansen. The school has some good staff, especially in the case of Radhika, who has just had her position made permanent at the school and speaks excellent English. I have good contact with her through Facebook and so can get a good idea of how things are going at the school. There are a few major areas of concern in terms of the buildings in this school. Firstly the upper level walkway has no safety railing. Staff and children manoeuvre round a corner by standing on a rickety chair and shimmying themselves around the corner. This should be a priority to get finished though as we have recently heard the whole roof of the main building has been torn off by high winds and is seemingly irretrievable. With the monsoon coming this is another real concern. The classrooms are however in relatively good condition (aside from the roof), though the toilet block was in a fairly poor state when I saw it. There is a large playing area which is great to see and the lower classes have their own area outside their classrooms.